2 volumes in one: 384 pages with tables; 324 pages. 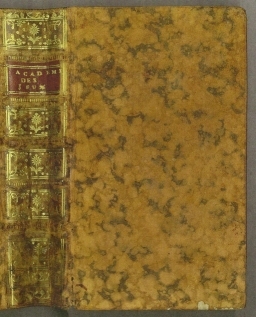 Duodecimo (6 3/4" x 4") bound in full leather with raised spine bands and gilt-lettered red morocco spine label, spine tooled in gilt and marbled page ends. 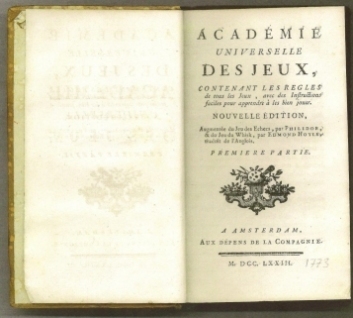 (Bibliotheca Van der Linde-Niemeijeriana: 3435) First published in 1717. 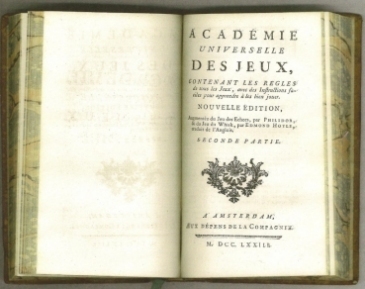 This enormously popular collection of games was first published in 1717 and went through numerous editions well into the 19th century. This edition of the work on chess was augmented by Philidor. Edmond Hoyle's work on Whisk was translated from the English. Worming to front heal hinge, small chip to front heal edge, neat hand written not to front paste down. Else about very good.